The current FC Zenit St Petersburg manager Andre Villas-Boas has donated a fabulous opportunity for two people to join him in Russia on a trip of a lifetime, in honour of his mentor and friend, the late Sir Bobby Robson. The two lucky football fans will meet Andre Villas-Boas and go to a FC Zenit St. Petersburg home game as guests of Mr Villas Boas who is personally donating two match tickets, Economy flights, along with two nights’ accommodation at the Corinthia Hotel. Andre says: “Sir Bobby is a true legend of the game,’ Villas-Boas says. ‘He was a great man, a great manager and a real gentleman. I often think of him and the inspiration he gave me not only at Porto but throughout his life. “Sir Bobby has influenced everyone who ever met him with his enthusiasm and knowledge of the game. The fact that so many fellow managers and clubs are supporting this campaign speaks more about his legacy than I ever could. This is the third global online auction that veteran voluntary fundraiser Gina Long has organised along with her Special Events Committee and as bidding currently stands, more than £45k has been raised. Every penny raised in the auction will help the Sir Bobby Robson Foundation and East Anglia’s Children’s Hospices and lots include a wide range of activities which would not normally be available to the general public. The football community has once again shown tremendous support for the cancer charity Sir Bobby launched in 2008 with lots including VIP tickets to the FIFA Ballon d’Or Awards in Zurich, the chance to play at England’s St George’s Park training base, a Messi and Xavi signed football, VIP tickets to the PFA Awards, boots signed by Philipp Lahm and UEFA Champion’s League Final tickets. A host of football clubs have contributed fantastic prizes including Newcastle United, Barcelona, Liverpool, Arsenal, Norwich, Yeovil, Fulham, Manchester United, Manchester City, PSV Eindhoven, Tottenham Hotspur, QPR, Chelsea, West Ham, Charlton and Ipswich Town, and the match-worn Gary Speed Sheffield United shirt has already generated bids in excess of £700. There are also lots available for fans of other sports including a tour of the McLaren Technology Centre & McLaren Production Centre, VIP tickets to the World Snooker Final, VIP tickets with full hospitality to the Badminton Horse Trials, a signed England rugby shirt, a Premier Experience at Newmarket Racecourse, Essex Cricket Club signed items, a corporate box at Brands Hatch and a Ryder Cup 2014 pin flag signed by the Team Captains. And there is a huge range of non sporting items and experiences available from art, jewellery, furniture, food, hotel stays and whisky, to punting on the Cam, a visit to Colchester Zoo or a trip to Germany and a tour of the CLAAS Combine Harvester factory. 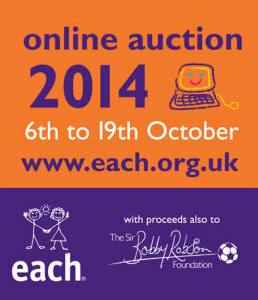 For more information or to register to bid, please visit www.sirbobbyrobsonfoundation.org.uk. The auction can still accept new lots. To donate, please contact Camilla Haycock at EACH on 01473 276193 or camilla.haycock@each.org.uk. Quite small Geordie. 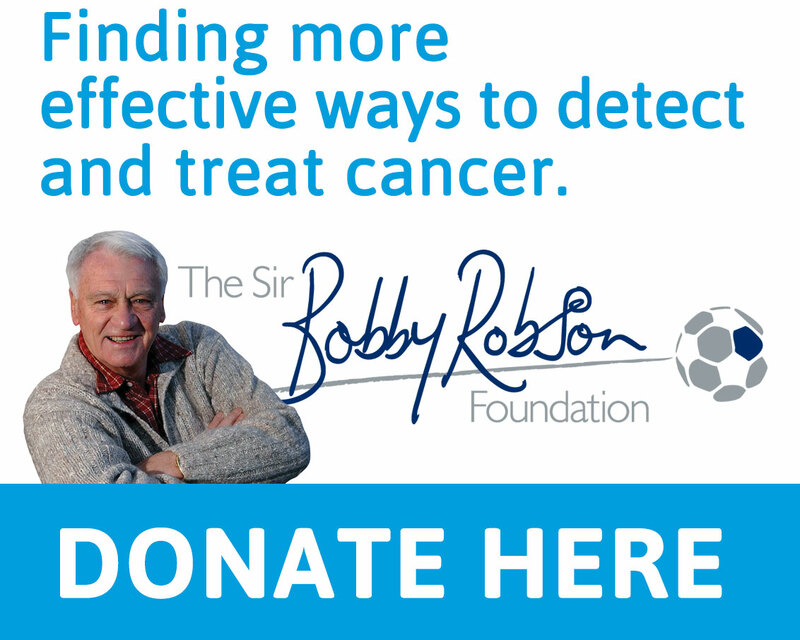 PR (good, not evil sort) for the Sir Bobby Robson Foundation and more. Please watch as Patron, Steve Harper, finds out more about our work. North News and Pictures Ltd.